This magnificent Castle is one of the oldest and most interesting Wedding Venues in the North East. There has been a castle on the site since the 11th Century and currently it is also the home of University College, Durham University. Along with Durham Cathedral and the other magnificent buildings on Palace Green the Castle is a massive Tourist Attraction. Many don’t realise that during term time it is also home to over 300 students as a Halls Of Residence. Yep – this during semester time this amazing wedding venue houses, feeds and entertains students. Can you just imagine living in a place like this whilst at university! 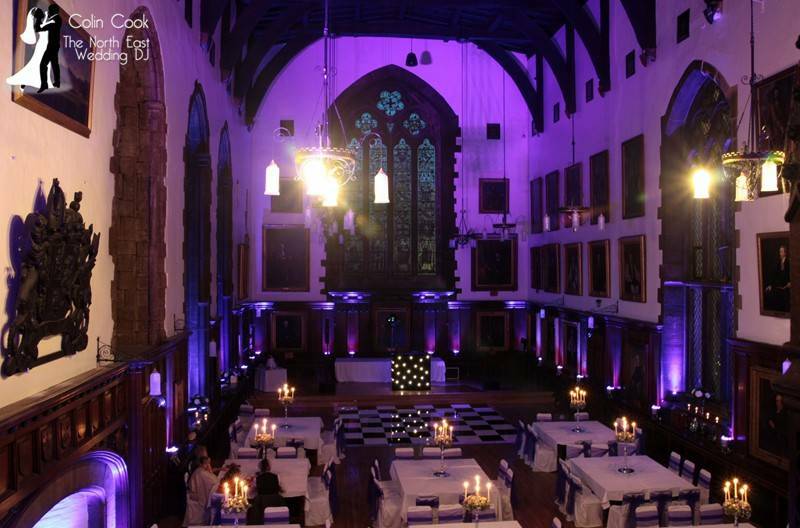 Come vacation time the students move out, the Event Durham team swing into action and the rooms are available for hire plus the Great Hall becomes available to hold incredible functions such as Weddings, Balls and so on. It has a charm and magic about it that very few places can boast. 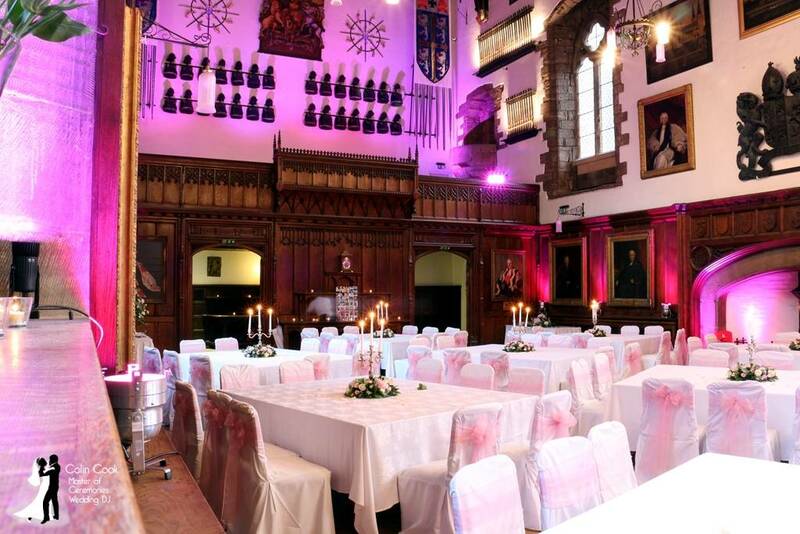 For a DJ or Disco, Durham Castle presents a few challenges. Firstly access isn’t the easiest – well it is 900 years old! Also the acoustics in the room are extremely difficult and the actual air capacity is massive! When choosing my audio equipment, this room is one of my main influencing factors. 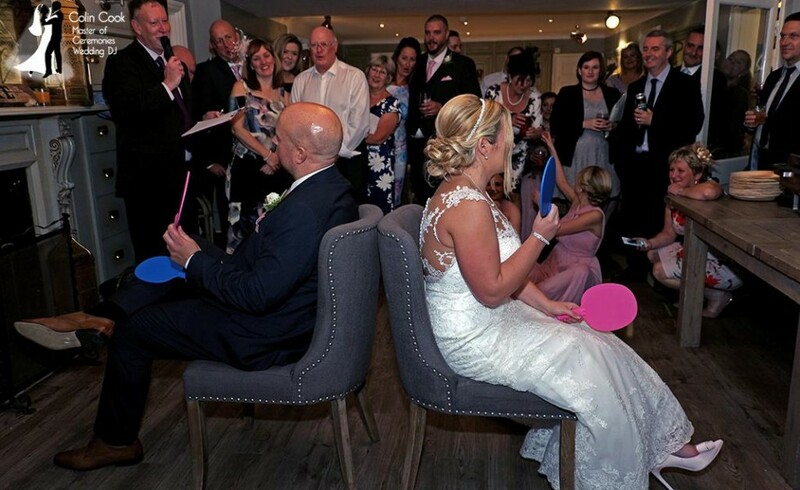 As Master of Ceremonies I am regularly booked by my clients to help personalise their day, presenting an occasion which truly reflects the personalities and sense of humour of my couples. 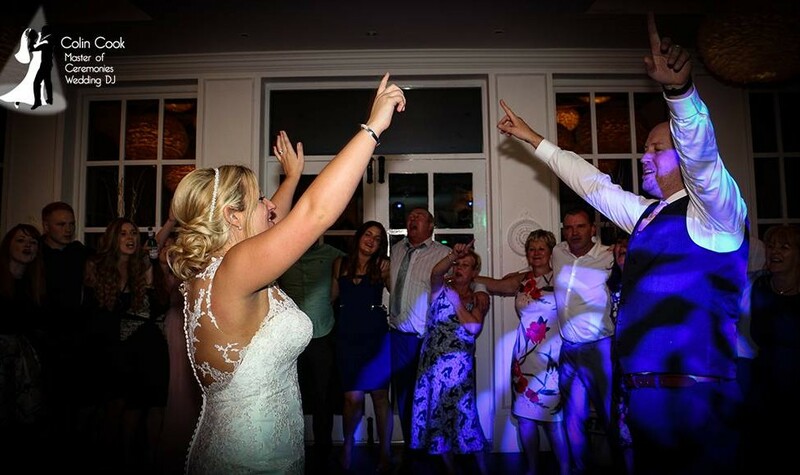 Having your own Master of Ceremonies is one way to truly create something amazing – a totally unique, personalised and memorable day for you and your guests. 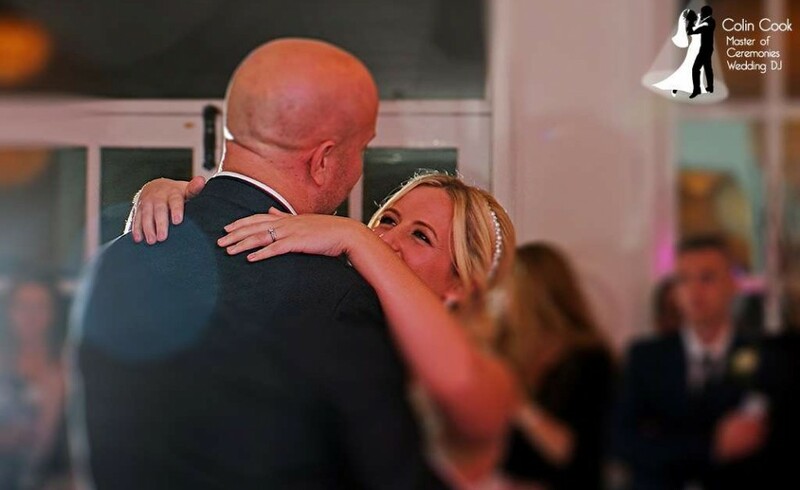 Plus, being a DJ this also means I can provide a complete sound track to your day, with fabulous music played at appropriate volume levels during your Drinks Reception and Wedding Breakfast. This music can reflect your own tastes and include choices from you and from your guests. Basically it allows you to relax and enjoy your day knowing that you have someone working for you and helping everything to run smoothly, looking after your guests and liaising with the venue staff. As you can see from the photos below, my equipment is neat, discreet and fits in perfectly with the character of the room set up for a daytime function. Being an ancient and historic site, the Castle does have it’s rules and also presents challenges to entertainers. After all, they didn’t have Discos back in the 11th Century! Access is via a small door and then the gorgeous but not very straight Black Staircase. The Great Hall is very large and the acoustics do not suit cheap sound systems or poor quality. In fact whenever I look to purchase new equipment the acoustics in the Great Hall are one of my main guiding criteria. This gives me confidence that the equipment I use is always a good match for the Great Hall and both sounds and looks great, whether the white All Day look or the black Evening Only one. Many couples here also like to book a band, whether a Ceilidh or a Wedding Band. I regularly work with bands here and my equipment is compact enough that I only need to have my speakers on the raised Dais (or stage area) and my main kit can be placed to the side. This is perfect where I am booked all day as it means my equipment can stay where it is for the duration – I simply need to move one of the speakers inwards slightly, add lights and all done! This is of great benefit as it means that the band members and DJ aren’t all trying to get their equipment in and set up at the same time. It also means that where needed there is no break in musical cover regardless of what time the band arrives or is ready. Moodlighting, or LED Uplighting is by far the most popular additional service I am asked for here – to the point I even offer it as a standalone service. the Great Hall is simply magnificent during the day but once dusk comes in this huge gothic hall is quite dark and much of the beautiful architecture is lost. The room lights are very basic and do not make the best of the Hall. However, with properly installed Moodlighting the room comes alive with an amazing atmosphere, a real WOW! Factor and creates the perfect setting for your Wedding Evening Reception. Again, please be careful here – I’ve been uplighting this room for 8 years and know how to get the very best out of it. I have also seem some really awful attempts by some DJs who simply dont have the creative flair, equipment or are willing to take the time to do this massive job properly. Rather than explain in minute detail just have a look at my photos below, then see what other suppliers provide. Always ask for photos and try to compare like with like. I genuinely believe that in this instance ‘Nobody Does It Better’. On the subject of Moodlighting, I hear you ask – Why do so many people choose Purple? That’s a great question, I’m glad you asked! Back in 2008 when I first installed Uplighting at Durham Castle it was the first time it had ever been done (as construction started in 1072AD that means the first person in 936 years!) it caused a bit of a storm. My work was featured in several magazines and of course caught the eye of the Castle Event Management team. The Purple looked amazing and as it was also the Bishop’s colours it became popular. As the photos were all of purple lighting couples were asking for the purple lighting. Even explaining the wide range of colours available everyone still seemed to want purple. In fact it wasn’t until 4 years later in 2012 when I got the opportunity to use a different colour for Damon and Mike’s incredible Christmas Wedding. This time I got the chance to do Red – the one colour I’d always wanted to try since first seeing this incredible Gothic-like room. The photos below show some photos from this wedding. I then had to wait almost another 2 years of Purple Uplighting before the next chance presented itself – this time for Lucy and Ed’s wonderful Wedding in 2014. They chose Pink which at first I was a little dubious about for such a ‘manly’ venue but it looked incredible! Lucy and Ed booked me for the entire day as their Master of Ceremonies, for Music throughout their day and of course to DJ on the evening alongside great function band Hip Operation, with whom I have worked many times. So to end the Moodlighting section – here is some Durham Castle Pink! One other popular service which I provide free of charge for those clients who book me for the full day is to provide music for their Drinks Reception, if required. Weather permitting this is generally held outside in the gorgeous Courtyard. I can prepare a set of music which can include your own tastes or even your choice of music and play it on a really good quality self-powered system (it’s even white to match everything else!). If the weather turns inclement and you move to the Tunstall Gallery then I can easily just move it there for you! 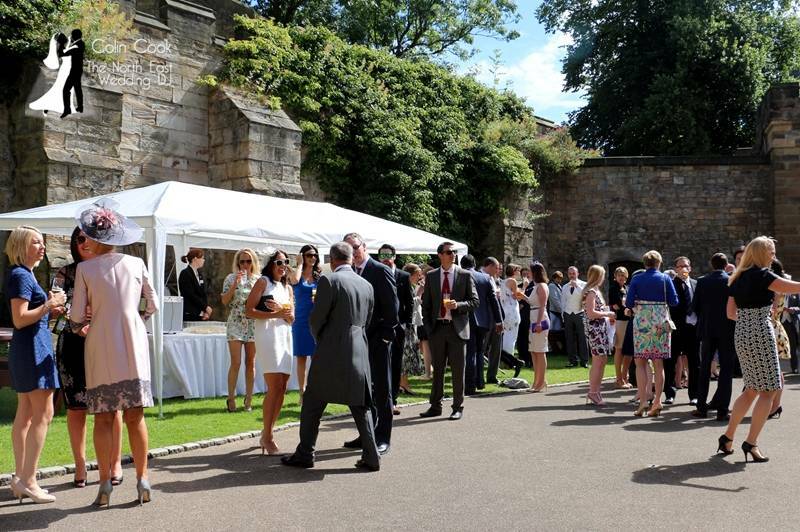 Durham Castle is part of Durham University and as a Wedding Venue is managed by Event Durham who also manage Hatfield College, St Aidan’s College, Trevelyan College, Grey College, St Hild & St Bede, Van Mildert College, St Mary’s College and Collingwood College. 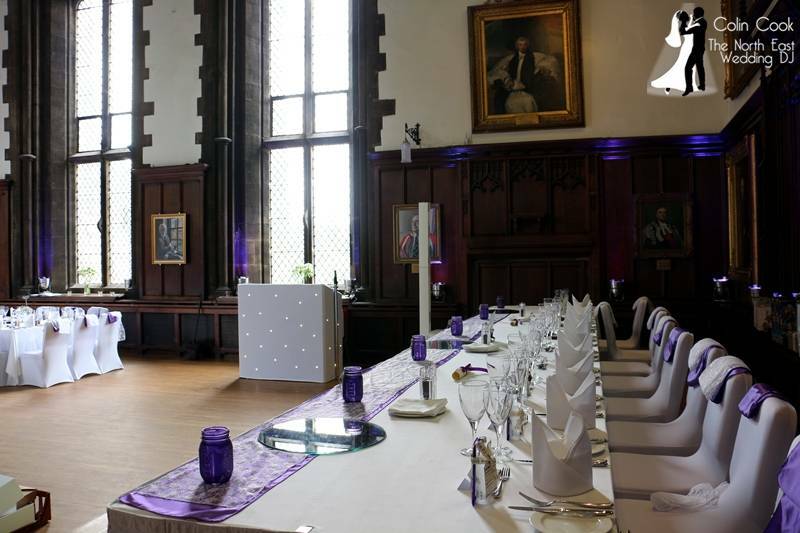 All of these colleges have excellent banqueting facilities and Colin Cook is proud to be a recommended supplier to all of Event Durham’s venues. If you are looking for a Master of Ceremonies, Wedding DJ or Wedding Disco at any of these lovely venues please get in touch with me. Here is a selection of photos taken at Durham Castle Weddings where I have been booked as Master of Ceremonies, Wedding DJ or to provide Creative Lighting.